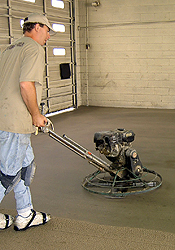 Trowel Applied Resurfacers | Floor Coatings, Etc. Trowel Applied Resurfacers are extremely heavy duty systems that are usually installed at a nominal ¼ inch (3/16 inch compacted) thickness. They consist of a 100% solids epoxy binder and a graded aggregate blend that is mixed into a mortar. The mortar is spread out using a “screed box”, and compacted and finished with a mechanical power trowel. They are used to reconstruct the surface integrity of severely worn, pitted, or deteriorated concrete, often instead of replacing it. Any of the above mentioned systems can be installed over these resurfacers to achieve the desired aesthetic effect. These systems can be used (with the right system on top) in any area needing major repairs or subject to extremely heavy traffic and or weights. They are becoming increasingly popular as an initial application over NEW Concrete when severe wear is expected. Contact us today at 302-322-4177 to learn more about our Trowel Applied Resurfacers.